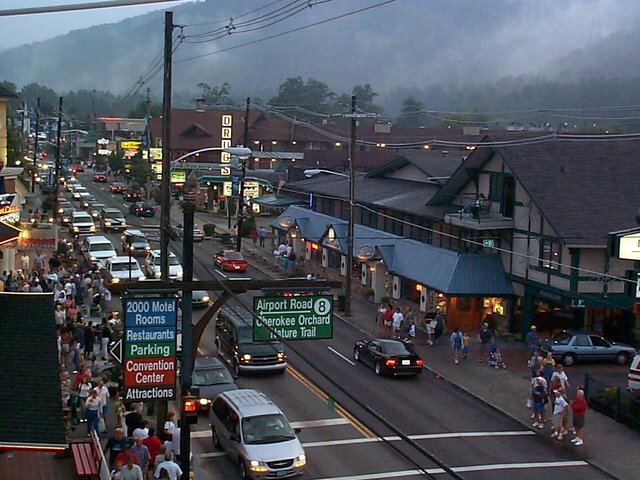 Gatlinburg, Tennessee is a veritable mecca for tourist attraction afficianados like me; I've been dying to come here for a couple of years now. How could I resist the pull of a place that can boast such disparate sites as the Ripley's Believe It or Not museum (“three floors of outstanding and incredible artifacts from around the world”) and Christus Gardens (“See Greatest Story Ever Told in a series of realistic life-size dioramas; rare Bible & coin collection”), plus Hillbilly Gold (“Play the world's most unusual miniature golf. Two 18-hole courses with challenging mountaineer hazards.”), the Mysterious Mansion of Gatlinburg (“Gatlinburg's scariest and most exciting attraction. Come see your nightmares come true, it's an experience you won't soon forget.”), and the World of Illusions (“The world's largest exhibition of action packed Grande Illusions. Make a friend disappear, walk away from your shadow, see a superman use x-ray vision and much, much more.”)? We pulled out of my garage at 9:11 Thursday morning to begin the short (but, it turned out, long and wonderful) drive, and after a stop at QuikTrip for a couple of cappuccinos (one hot and one frozen) and a box of Sour Patch Kids, we were off. We drove up US 23 for a couple of hours with only one bathroom stop, until we arrived in Tallulah, Georgia. Around 11:30 we took a detour onto the Tallulah Gorge Scenic Loop and stopped at Tallulah Point Overlook (“A mountain tradition since the 1920s”) to get out to gawk at Tallulah Gorge, which is a 1000-foot chasm carved out by the Tallulah River, and which contains a series of five waterfalls. (The town it is in, not coincidentally, is named Tallulah Falls.) 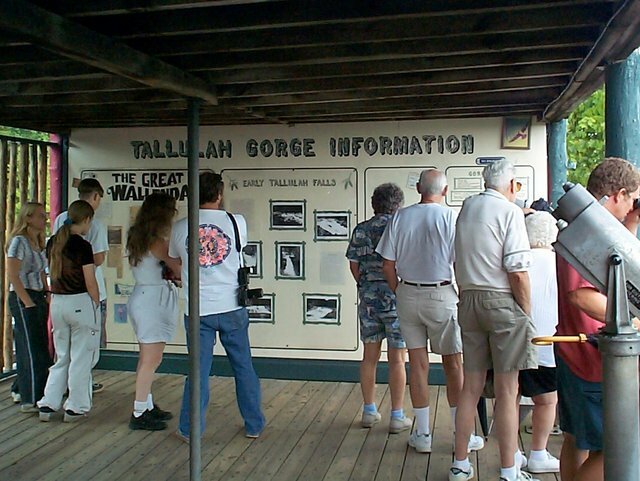 After we looked at the gorge, read about Carl Wallenda's 1970 tight-rope walk across the chasm, and browsed in the gift shop (purchasing one Cheerwine cherry soda, a bag of Tallulah Gorge peanuts, and a couple of postcards), we walked up to the Tallulah Village store and browsed some more. We finally left at around 12:30. We didn't get far out of Tallulah Falls before stopping for lunch at Granny's Kuntry Kitchen in Clayton, GA, where a hand-written sign told us that “Our food is made to order. Good food takes time. You cannot be in a hurry. Especially on weekends.—Chef Don” Chef Don? I assumed that Granny did the cooking. Well, though they did take about twenty minutes to arrive (the sign was right), the grilled chicken and mashed potatoes were good anyway. After lunch we made it a little ways up the road before stopping at the Dillard Antique Mall in (guess where?) Dillard, Georgia. Finally, at 2:48, we crossed over into North Carolina. After five and a half hours on the road, we were...well, about a hundred miles away from my driveway. But after our stop in Dillard we managed to drive for over an hour without getting out to look at anything; we drove through Cherokee, NC, passing the various tomahawk shops, teepees, and “Take your picture with a genuine Indian” stands without stopping; we were even too tired to get out and play with the baby bears. 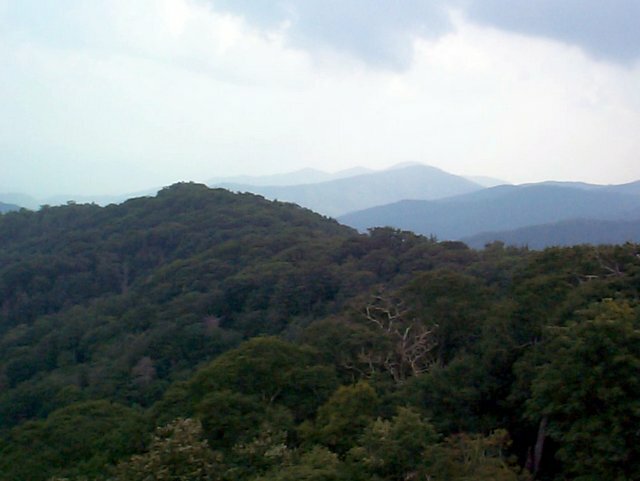 The Great Smoky Mountains National Park was established in 1934 and was among the first national parks assembled from The Great Smoky Mountains private lands. 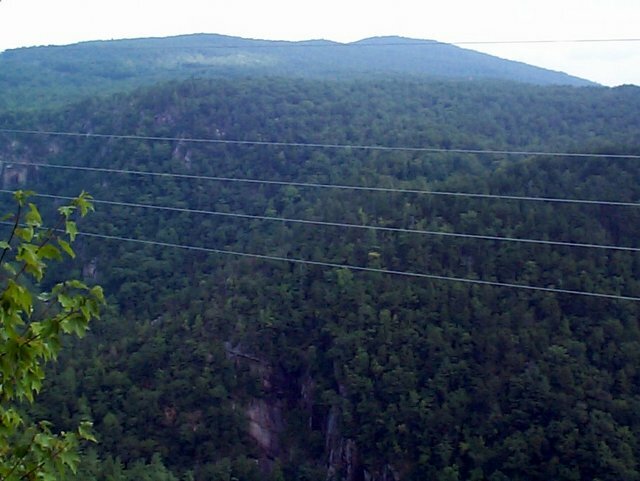 It's vast, covering thousands of of acres along the North Carolina and Tennesse border, and contains, accodring to the brochure, “1,500 flowering plants, dozens of native fish, and more than 200 species of birds and 60 of mammals.” It also contains species of salamander that have never been found anywhere else. Our drive through the thirty or so miles of 441 that goes through the park took about an hour and a half, mostly due to my desire to stop and take pictures at nearly every overlook. It's not a place one wants to speed through anyway, though, even without a camera. It is, in places, unspeakably beautiful. Our cabin in the mountains Finally, more than eight after our departure, we completed the 200 mile drive and arrived in Gatlinburg proper. We checked in at the East Tennessee Realty office and drove the five miles to our cabin, which is at the end of a steep gravel road that my Nissan doesn't particularly like driving. 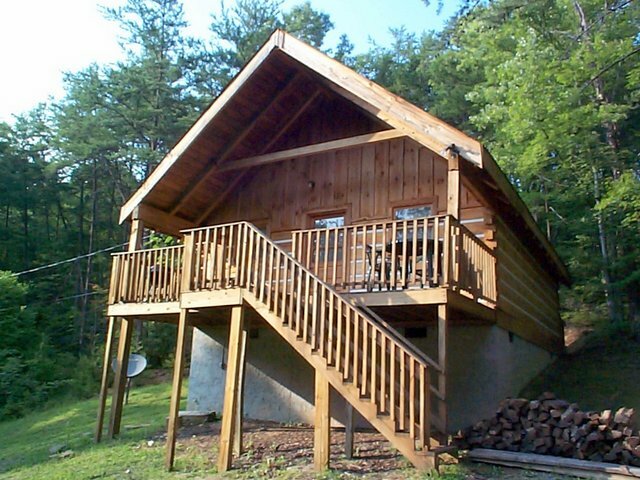 The cabin, though, is wonderful; it's well furnished, comfortable, and private and secluded. After about an hour of unpacking and then relaxing in our cabin, we headed back to Gatlinburg, with dinner as our main objective. 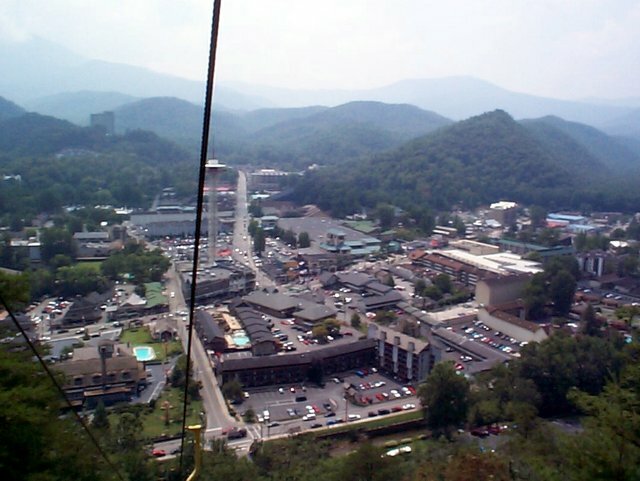 The strip of Gatlinburg along 441 is incredible; it is, I think, the exact opposite of a sensory deprivation chamber. There is so much to see and do, and so many people there seeing and doing, that one gets a little overloaded. 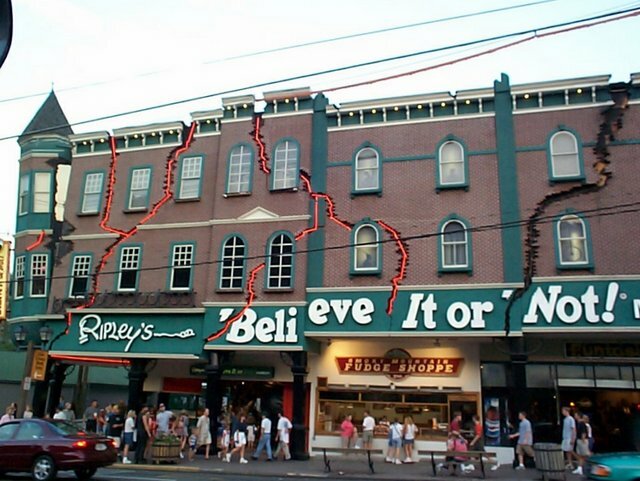 After about an hour of walking up and down the strip, we bought Ogle Dogs (foot-long corn dogs) at Fannie Farkle's (“That's a combination of two words,” Anna said, “one them being sparkle.”), and then went into Guiness World of Records Museum. We spent over an hour looking around, reading nearly every plaque, comparing our weight with that of the worlds heaviest man (you know, that guy they buried in a piano case) and our height with that of the world's tallest man. 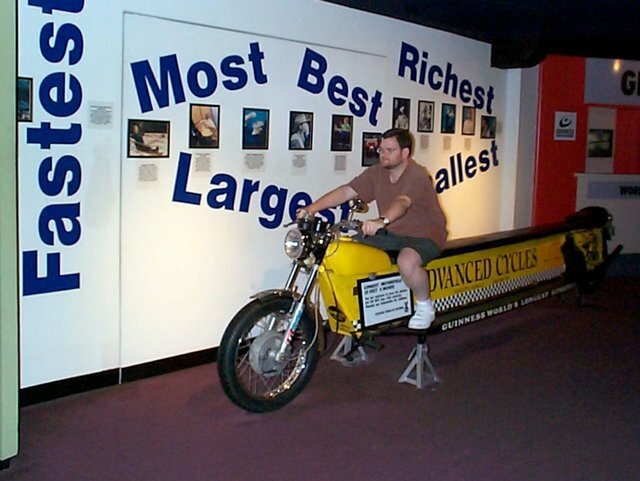 Some of the things you see in the Guiness World of Records Museum are interesting, but some of them make you shake your head and wonder what people are thinking. Did you know, for example, that there's a world's record for cricket spitting? In July of 1998, Danny Capps of Madison, Wisconsin spit a dead cricket 30 feet 1.2 inches. His mother must be so proud. We finally returned to our cabin a little after 11:00, exhausted after perhaps the single busiest day of our lives, but also very happy after what was, at least to me, one of the single most satisfying vacation days ever. And it was only the first day of this vacation! We slept in Friday morning and then had a breakfast of Pop Tarts, orange juice, and coffee. I then spent the next four hours creating my Day One travelogue, while Anna alternately read, watched TV, and napped, never once asking, “Aren't you through yet? !” She deserves a medal for her patience and tolerance. We went to Atrium Pancakes for lunch at 1:15. Anna ordered the chocolate chip and coconut pancakes, which I'm afraid aren't rendered very well in the picture, while I had plain old pancakes with ham and eggs. After lunch, we went to the post office to mail a few post cards and get stamps for a few more, and then returned to the main strip of 441. We went into Mountain Mall, looked around for a while, bought about fifteen dollars worth of books at Book Warehouse (including three John Bellairs novels, which have really cool titles like The Revenge of the Wizard's Ghost and The Spell of the Sorcerer's Skull), and then set out for Ripley's. We saw the shrunken heads, chastity belts, and instruments of torture, but we didn't see the dime; we did, however, see a stuffed two-headed cow, a chain of chewing gum wrappers that's over a mile long and which a school teacher spent almost two decades constructing, and a funhouse mirror that made me look like my legs went just about to my neck, with practically no torso in between! We also had a wax cast of our hands made, a process that involved dipping our hands in 136-degree wax about a dozen times, waiting for the wax to cool, then carefully extricating our hands from the wax to leave a Chris-and-Anna-holding-hands shaped mess of wax. It was a most unusual experience, and Anna is delighted with the results. 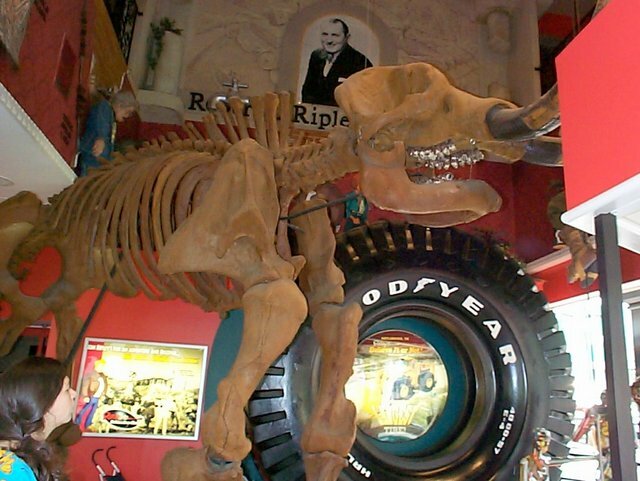 Here are a replica of a woolly mammoth's skeleton, a horse statue made of coat hangers, and Robert Ripley's personal favorite item from his collection, the Fiji Mermaid, which was fabricated out of the upper section of a monkey and the lower half of a fish, and exhibited in the late 1800s as a genuine mermaid by P. T. Barnum. 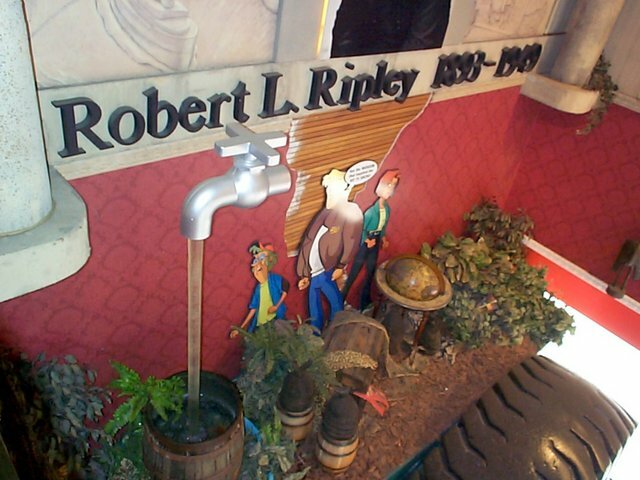 While we were in Ripley's (a span of time greater than two hours), a thunderstorm came up and soaked the city, even causing the power to cut off briefly a couple of times as we made our way through the exhibits. After leaving the museum, we trudged up the steaming streets, and ended the day with dinner at Blaine's Bar & Grill. After eating, I took a few pictures of the still-wet city streets and the surrounding mountains from the balcony outside the third floor. Finally, we went to the Ole Smoky Candy Kitchen (which, despite the name, was not that smoky), bought a half-pound of bridge mix (mostly chocolate covered raisins, peanuts, and almonds) and came back to the cabin. 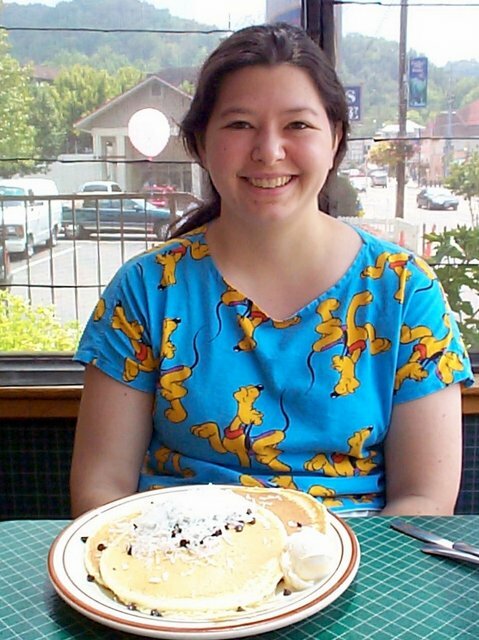 We started our third day with breakfast at the Copper Kettle Pancake House, one of approximately a thousand restaurants in Gatlinburg with the word “pancake” in its name. We both had the Mountain Breakfast, which includes eggs any way you like them (we went with scrambled), home fries, biscuits and gravy, your choice of sausage or bacon, and coffee or tea. It was loaded with fat, sodium, and cholesterol; I suspect there was even some nicotine in there somewhere. I loved it, though; left to my own devices, I'd put gravy on everything. And I did. 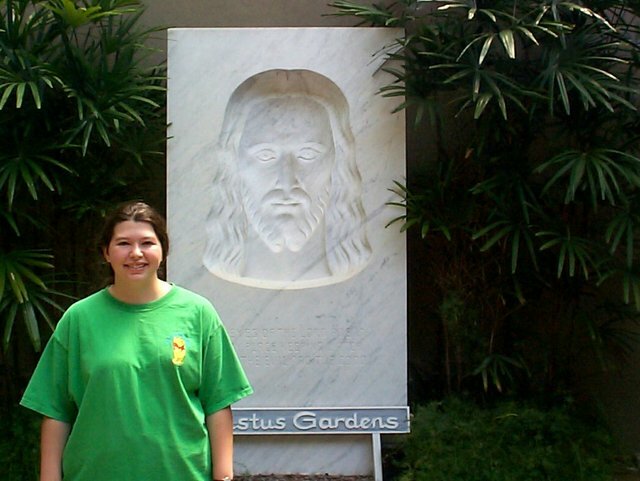 Next we went to Christus Gardens, Gatlinburg's most pious attraction, the complete opposite of the Ripley's museum. It was created over forty years ago by a man named Ronald S. Ligon, after he was stricken with tuberculosis and nearly died. Feeling that his recovery was the result of divine intervention, Ligon decided to build a memorial to show his gratitude. 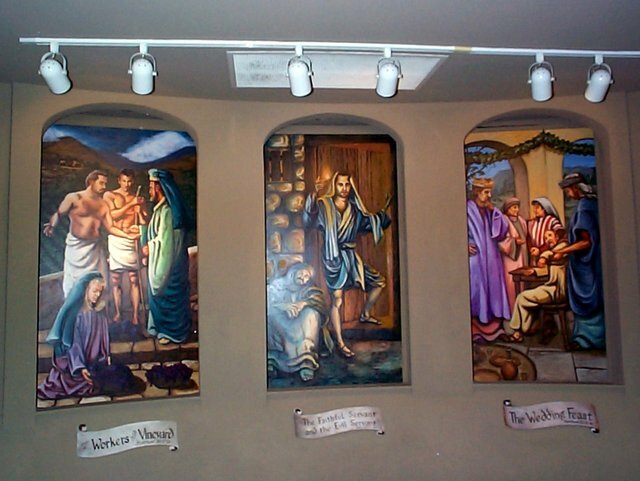 The result is a series of dioramas depicting Some of the murals at Christus Gardens the life of Christ, from the Nativity to the Ascension, complete with dramatic lighting, sound effects, and narration. The museum also contains a series of paintings depicting various parables, a small but pretty outdoor garden, and a collection of Biblical-era coins. It also features what is described as the single most photographed thing in Gatlinburg, an image of the face of Christ carved in a 6-ton block of Carrara marble, the eyes of which seem to be looking at you regardless of how you approach it. 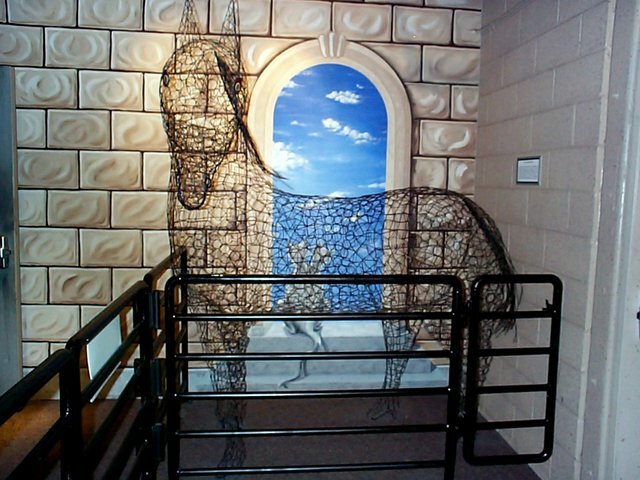 We spent about forty-five minutes going through the museum and then browsing through the gift shop. When we left, we were ready for an uplifting experience of a different kind. 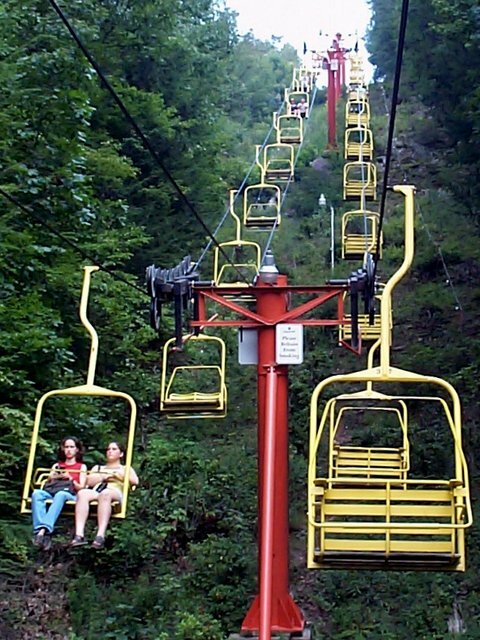 The Gatlinburg Sky Lift has been taking people up to the top of Crockett Mountain for over forty-five years now. It wasn't one of the things I had planned on doing, but Anna thought it would be neat so we did it. I'm glad we did, too; it was quite an experience taking the ten-minute ride on the chairlift up the mountain, looking down at the streets and the people and the city. We spent about twenty minutes at the top of the mountain; we looked at the cheesy gifts in the gift shop, ate some Ben & Jerry's ice cream, and then rode back down. The ride back down was even neater because it gave us a good view of the city and the mountains surrounding the city. Next we went to the World of Illusions, a fairly recent and, frankly, disappointing attraction. 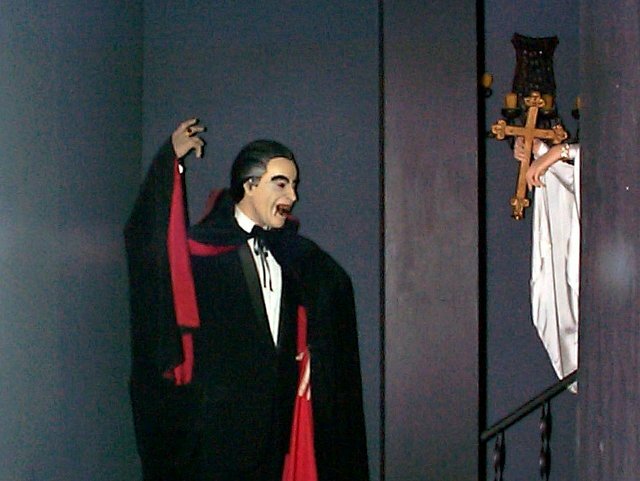 It's basically a wax museum that uses lighting and mirrors to make it look like Dracula is turning into a bat or the person on the other side of the booth from you has disappeared. 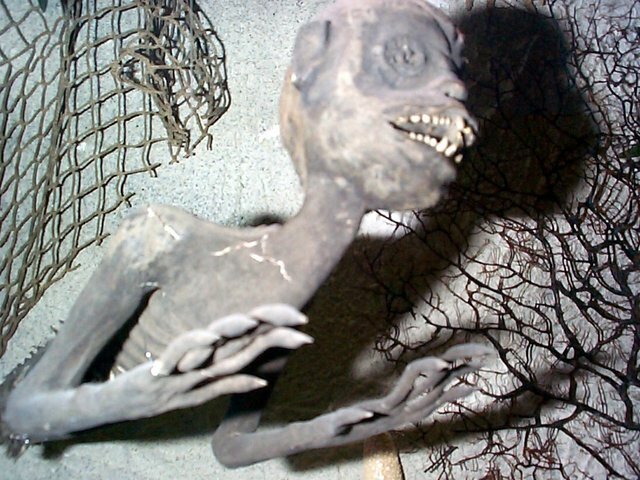 The most interesting thing, to me, was found in the Frankenstein display: the wax figure of Dr. Frankenstein, I would swear, had been taken from a now-defunct wax museum, specifically from a MASH display. He looked just like Hawkeye Pierce (or at least as much like him as wax figures ever really do), even down to the dogtags (though I couldn't read them) and the army-issue olive drab belt and pants! 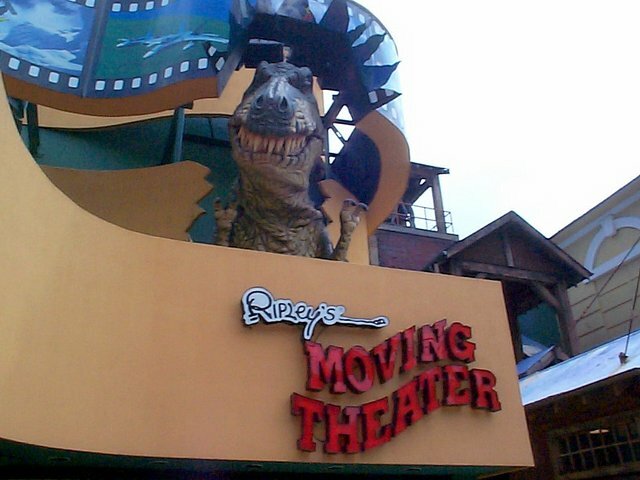 The Ripley's Moving Theater was a little better. There are two movies to choose from; we chose the roller coaster one. Just like a real roller coaster, the time we had to wait was about three times as long as the actual ride. It did feel like a real roller coaster, though, no doubt due to the fact that (as the posters told us) the seats moved in eight different directions. By the time we were done my tucchus was quite sore from all the bumping and jerking. We went back to our cabin to rest for a while, but by about 5:30 we were getting hungry. 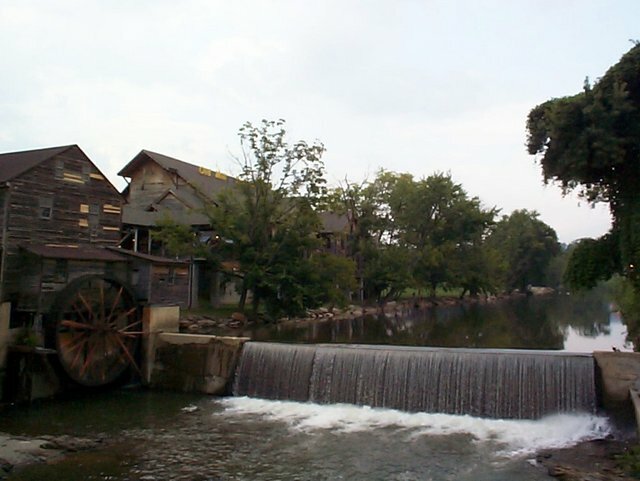 We decided that, since we'd seen most of Gatlinburg already, we would go north a couple of miles to see what Pigeon Forge had to offer. Pigeon Forge is a lot different than Gatlinburg. It's a tourist town too, but not quite in the same way; it's a little more subtle, so naturally I didn't like it as much. 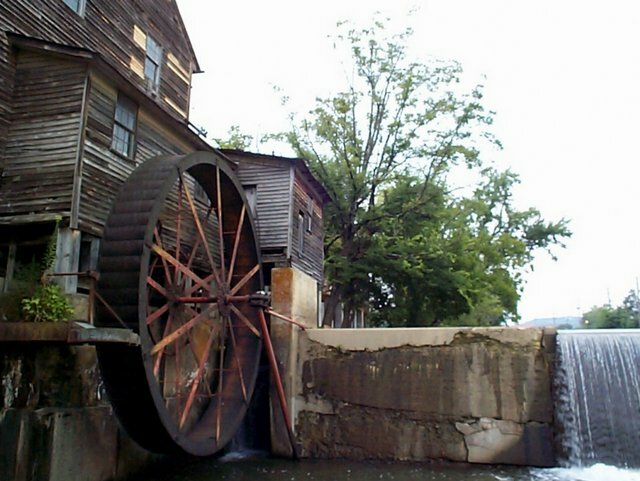 It's biggest attraction, of course, is Dollywood, Dolly Parton's amusement park, but it also has plenty of minature golf places, go kart rides (both indoor and outdoor), laser tag places, and even an indoor skydiving attraction. Fortunately, though, our objective was dinner, so we didn't have to deal with any of that. We picked The Old Mill Restaurant because it sounded interesting in the guidebook Anna had picked up somewhere. It was interesting, and good; our meals (sugar cured ham for me, turkey and dressing for Anna) included corn chowder, corn fritters, salad, mashed pototoes, green beans, and our choice of dessert. It was a lot of food, and it was all really good. It was worth the half-hour wait. For the historical background on Gatlinburg, and for the many hours of pleasure it has given me, I am indebted to Tim Hollis's book Dixie Before Disney: 100 Years of Roadside Fun.